PermaMarks: Permanent marking players in your party or raid (only possible if your are group or raid leader) with just a few clicks. 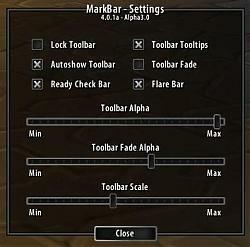 FlareBar: A smaller Toolbar for the new RaidWorldMarkers. Then you only need to click on the Start button and MarkBar automatically marks the selected player with the appropriate symbol. /mb mark n (n=0-8) = Sets mark to current target (useful for use within macros). Feedback and bugreports, goes to the comments! Any way of removing these HUGE buttons? If not, could the feature be added? The make the addon take up way too much space, and I have never found a use for them.. I don't get the whole start/stop thing. I don't want the players marked, I want the marks to stay on the mobs. The way it used to work, I assigned a target mark to a player, then announced it in party/raid. I could easily assign and reassign. Marks could be announced at any time to remind people. Now I can't announce and if I click that stupid start button it removes the mark from the mobs I've already marked. In TBC when CC and marking was required this mod was essential in both parties and raids. Now its useless for that purpose. Please put the announce marks ability back. But hey the little flare tab is nice. Many thanks going to check this out when I get home from work, glad you found a way to add flare capabilities, now I can drop smoker. I've had you marked as a favorite so I could watch this addon and add it to my collection when it was further along... you are ready, young padawan. Thank you! When comes out Beta1.0 RC1? Maybe tonight (utc) or tomorrow! PermaMark profiles are available for Beta1.0 RC1? No! They have a minor priority! What about the good old mark-descriptions? That will be available for Cataclysm, but currently they simply do not make sense. You had said that the raid world markers are protected. Why they are now in the toolbar? But I still hope that Blizzard releases the actual function and I can apply a clean way. Love the bar. It fits my UI perfectly. Just one thing I keep getting an error spam from it. It's a little annoying, and funny at the same time. Last edited by Tarran : 10-28-10 at 10:06 PM. Is the ready check protected? Would you be able to put a ready check button on the bar? Downloaded this and it looks very promising, I was curious if you planned to add the flare system to the frame? I am hoping that is an idea sitting on the sidelines for this addon as I am looking for a better raid managing frame than the one that blizzard currently has, something that would fit alot better in my ui. Last edited by braininblack : 10-26-10 at 07:20 AM.